Colonel Muammar Gaddafi from Libya was is recognized worldwide for his penchant for luxury fashion and other oddities has reportedly designed himself a new car, which is claimed as the safest car in this world. The car named as the Saroukh el-Jamahiriya, meaning ‘Libyan Rocket’ is a saloon car fit for five people. The car is designed to resemble a rocket in shape from its front and tail end. The car is powered by a V6 engine which delivers a max power of 230bhp. The car was unveiled during the African Unity Organization’s conference in 2009, by Gaddafi. This car is available with airbags, collapsible bumpers that supposedly help during a crash, and an electronic defense system. As for the function of the electronic defense system, it is not yet known how the feature will operate and what exactly it does. 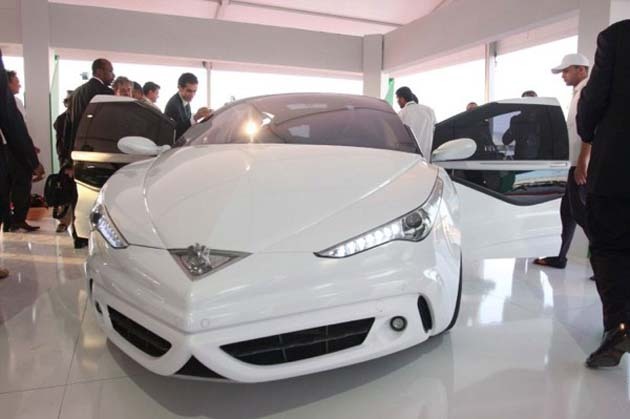 The Libyan Arab Domestic Investment Co. chairman, Dukhali Al-Meghareff, who produced the prototype for the company said that this car was a revolutionary model in the history of automotives. He went on to say that their leader spent many hours to come up with an effective answer. This car is the safest car to be produced anywhere in the world. nice car and the modle. it is looking awessome and engine is power full. I hope you change your prospect of life soon…Gaddafi sir………..